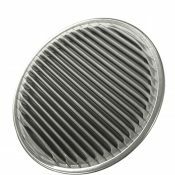 The precision stamped mesh filter discs from Ejay Filtration are made for applications that require the highest level of purity. 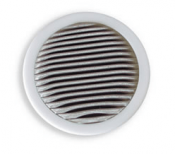 Ejay Filtration builds each stamped mesh filter disc according to your needs and specification, so every item is a perfect fit. Ejay Filtration builds strainers, fuel filters and more for the highest level of performance, health and safety in air filtration and system performance. The sintered stainless steel woven wire mesh filters are made according to exact specifications to filter liquids and gases according to precise tolerances. Specialty tooling ensures uniformity across all units and ultrasonic cleaning with sealed packaging ensures every mesh filter disc is delivered uncontaminated and ready for installation. Contact Ejay Filtration to order precision filtration products for your needs and customize the product to suit your applications. Other micron ratings and closer tolerances available. Contact our Sales Dept.